Congratulations to Mike Emmel and his staff at Interior Woodworks on receiving the 2013 Best of the Best, Design Portfolio Award from Custom Woodworking magazine. 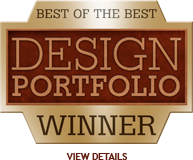 Design Portfolio Awards are given annually to recognize custom woodworkers for their outstanding design, craftsmanship and execution. Entries for this coveted honor were submitted from across the United States and Interior Woodworks was one of only six recipients. This year Interior Woodworks celebrates 20 years of woodworking located at 1605 E. Broadway, Bismarck.